My passion is writing! I am a freelance writer that specializes in product reviews and guides, eBooks, articles, and blogs. My favorite thing to write is poetry. My other passion is butterflies as you will see in much of my work. Give my creative fingers a try! I also have a virtual assistant business and do a variety of administrative services such as document design in Word, databases in Excel, animated presentations in PowerPoint, and newsletters or other desktop publishing in Publisher. Scroll down to see samples. To send me an email click on the envelope above my name. To go to my business website click here The Butterfly Connection. Click on Subscribe above to receive an email when I have added a new poem, book or other project to my portfolio. Then once a month I will send you the Butterfly Connection Newsletter with lots of information, news or tips about butterflies and butterfly crafts you or your children can make. Sprint has sprung! See what's happening this spring at the Botanical Gardens. Read how the population of monarch butterflies did last winter. Learn how to grow a mini-garden so you can grow veggies for your salads. Plus you can learn how to grow a butterfly garden. The Kids Activity Page has some fun summer things to make. The last page tells about the Butterfly Exhibit at the Desert Botanical Gardens in Phoenix, Arizona. This medieval mystery takes place in the 1400s and is about 26-year-old Prince Rolond who goes by the nickname of Rojo, which means red in Spanish. His friends gave him the name Rojo because he loves the color of the blood he spills. The story begins when one of his enemies has kidnaps and beats him leaving him for dead without memory of his violent past. He experiences many adventures as he struggles to discover who he is and who he wants to be in the future. His adventures include intriguing love scenes and some violence of one-on-one fights with weapons. My passion for butterflies is apparent throughout these poems. My mother is responsible for passing the love of butterflies on to me after she passed away in 2000. One of my poems in particular (Pain’s Inspiration) is special because it was inspired by my mother, my dad and oldest brother who are no longer with us. This is a book compiled of poems that I have written during my lifetime. You can see what a full life I have had and hope it is inspirational for you to follow your dreams even when difficulties arise. I also have books about my life published on Amazon.com. This unique true story is about a young woman from the Midwest who is a battered wife with the dream of learning to fly. Circumstances bring her to Los Angeles where she meets a man who is a flight instructor. They become friends and he teaches her to fly but then somewhere between the takeoffs and landings something special takes off…a 30-year love story. The story takes you through many relationship issues such as domestic violence, divorce, racism, mixed marriage, trust, child custody, love, caregiving, and grief. It will send shivers up your spine as it takes you through the thrill of flying solo for the first time. It will give you inspiration to never give up on your dreams as well as mesmerize you with the meaning of a dream that will make you wonder where dreams come from. This presentation was written to help anyone wanting to make major changes in their life. The original is animated but could not be shown here in that format so if you would like the animated version, let me know. The book called Be Like a Butterfly goes into more detail than the presentation. The objective is to help you learn how to plan changes needed for a particular desire or dream such as a change in career, a relationship change, or even bad habit changes. The life of the butterfly was instrumental in inspiring me to compare 10 steps that have been categorized into four groups or stages with the changes that a butterfly goes through. These 10 steps will show how to organize the plans for your changes using the similarities of the four stages of the butterfly’s life, from laying eggs being like planting seeds of ideas for the changes to the adult butterfly completing its metamorphosis as being like you succeeding in making a change. This book was written to help anyone wanting to make major changes in their life and goes along with the "Changes" presentation. It is an easy-to-read book developed from the presentation. The objective of this book is to help you learn how to plan changes needed for a particular desire or dream such as a change in career, a relationship change, or even bad habit changes. I chose this title because the life of the butterfly was instrumental in inspiring me to compare 10 steps that have been categorized into four groups or stages with the changes that a butterfly goes through. These 10 steps will show how to organize the plans for your changes using the similarities of the four stages of the butterfly’s life, from laying eggs that are like planting seeds of ideas for the changes to the adult butterfly completing its metamorphosis as being like you succeeding in making a change. This is a true story of my time with my late husband who had vascular dementia for the last three years of his life. It tells of how I learned to deal with being able to understand him and communicate with him. It had it's difficult times but also a silver lining that I enjoyed. Anyone with loved ones that have any kind of dementia should enjoy the story. Tips on how to deal with stress done in presentation format. The original is animated but could not be shown here in that format so if you would like the animated version, let me know. It will explain the meaning of stress and how it goes from good to bad stress by many triggers that cause it. It addresses how to not have stress just by exercising some simple rules and taking care of yourself. The author is not in the medical field but has had a lot of experience with stress and what it can do to your health and wants everyone to be aware of the dangers of having too much stress on the job and off. 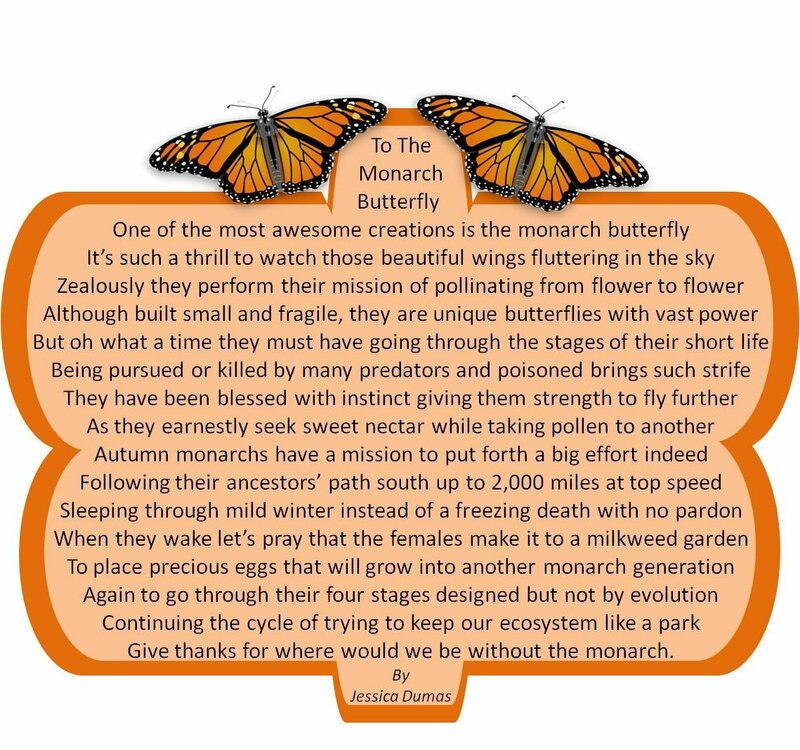 Monarch Butterfly 2.0: 101 Reasons to Love Our Favorite Orange and Black Butterfly From A to Z - Jessica Dumas. Kindle eBooks @ Amazon.com. This book is our second edition on the monarch butterflies that will expand your knowledge and admiration of the favorite and most loved butterfly in the history of man. After the first chapter summarizes the first edition, some of the topics to wet your learning appetite are: • Exciting news and events about the monarchs such as the Blitz • Explanation of scientific names with tips on how to pronounce them • How to become a monarch expert on a professional level such as a Lepidopterist • Ideas of what you can do as a monarch advocate such as tagging monarchs • Tips on monarchs including fun butterfly related activities for the kids to do • Monarch mysteries answered such as how do they know where to migrate to • Answers to FAQs about the monarchs like why is global warming a threat to them • Little known facts about the monarchs such as how they are able to navigate • Lessons to learn on how you can help save the monarch by spreading awareness • Fun things to do like having your next reunion or party at a butterfly conservatory • How to have a vacation in Mexico with a tour to see millions of monarchs. A guide for caregivers and loved ones of people going through benzo withdrawal that I wrote with the help of my daughter who has been suffering from benzo withdrawal symptoms for over two years. The poem I wrote to her is a list of many of the symptoms suffered by her and others suffering through the horrible withdrawal symptoms when getting off of a benzo drug such as Klonopin, Xanax, Valuim or many others. The Dolphin and the Butterfly: A Lesson Learned in Kindness - Kindle edition by Jessica Dumas. Children Kindle eBooks @ Amazon.com. Oh, what an awesome work of art is the majestic monarch butterfly. Thrilling to watch bold black and orange wings fluttering in the sky. They joyously perform their duty pollinating from flower to flower. So delicate, humble, and vulnerable yet are blessed with vast power. Hard times they have going through the four stages of their short life. From egg to caterpillar that eats all day to a chrysalis full of strife. To become a beauty spreading wings of a new creation. With the plight of a dwindling population. Autumn brings a mission to put forth a big effort indeed. As they navigate a migration flying southwest at slow speed. To hibernate in mild winter instead of a cold death with no pardon. When Spring comes the mothers-to-be go to find a milkweed garden. To lay her 300 eggs that start a new generation of monarchs who pollinates. As she wonders if all the milkweed dies, will we do something that resonates. How much we love the insects and birds that travel back and forth to spread. Pollen that is needed to give us fruits & vegetables to go with our daily bread. So it is not clear how we can keep the earth looking like a park. When we keep stealing the habitat from the monarch! Finding a top social media marketing agency can be a real task but a necessary one if your business isn’t doing so great and you want to improve it with some help from someone who knows the answers on how to get your brand better known on social media. Finding an agency that has years of experience and outstanding customer reviews that you are happy with may seem impossible but I’m here to say there’s no need to have nightmares over it just keep reading on how to find the top social media marketing agency for your business. Get Protected with One of the Best Samsung Galaxy Tab S3 Covers/Cases! Is your new glass Samsung Galaxy Tab S3 protected from accidents yet? If not, it should be! This is the first Galaxy Tab to have a glass back, making it easy to accidentally crack your tablet. It’s bad enough to worry about the front of your tablet but now you have to worry about the back of it too! But have no fear, this is your guide to the best Samsung Galaxy Tab S3 covers/cases, which means accidents will soon be a thing of the past. A tablet cover is meant to protect just the tablet. A case is meant to protect both the keyboard and the tablet. Even though technically this is the definition of the cover and case, you will find that the two words are commonly interchanged as in the below descriptions. If you’re an avid home coffee drinker or barista, do you have a coffee bean roaster? If not, this Behmor 1600 review is for you! Even if you already have a roaster, you may be shopping for a new one so this review is also for you. Coffee bean roasting is normally done commercially but for the past few years it has become more and more popular to do at home using roasting machines like the Behmor 1600. This Behmor 1600 review is focusing on the upgraded Behmor 1600 Plus that came out in 2014 with more manual capabilities that users had been requesting for a few years. If you have the original 1600 and decide to get the 1600 Plus upgrade kit or the new model, it is a good idea to read the user manual to make sure you understand the changes. The basic look of the roaster is the same and even though the price went up some, it is still at a medium-low so it is within the buying power of many coffee lovers. Did you know that the name “Capresso” is the combination of Cappuccino with Espresso? The brand name Capresso was developed in 1994 by the U.S. leader in making premium coffee equipment for the home, JURA Inc. of Switzerland. They produce coffee equipment worldwide for over 50 countries. Several of the innovated Capresso products have been featured on TV and in magazines as well as the Internet. Many of their products have been the first of its kind in the industry such as coffeemaker/ grinder combinations. This Capresso Burr Grinder review will tell you about the Infinity burr grinder model that comes in two durable finishes of black and brushed silver for around $100-150. One of the easiest ways to improve the taste of home brewed coffee is to grind whole coffee beans fresh immediately before brewing. The basis for grinding coffee beans is to generate a larger surface area for the hot water to extract the flavor and oils from the beans. If coffee is ground too far in advance, the exposure to air causes the flavor to be released making for a weak cup of coffee when the grounds are brewed.